Guardi alias Francois Lopez is a musician with multiple talents, a song writer above all. First of all, he is known on the rock scene as a member of the Clandestins and Guerilla.. For the past ten years, he has been equally composed the music for about ten modern dance creations. 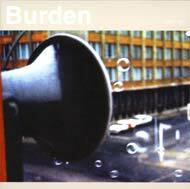 In 2000, Guardi inaugurated a new project called Burden, which involves inviting different musicians, from different horizons, to compose together electronic music and to propose a graphic artist to design the cover of the final album. The first CD “Burden 01” has been released with Guardi together with Jeff Hicter, Kristina Solomoukha designed the CD cover . The second release is available today, resulting from the collaboration of three musicians, Push Push, Jeremy Bristock and Guardi, the visuals, this time were made by the artist Melik Ohanian. Following the electronical music carved out on the first album, Burden 02 is a mixture of sounds: jungle, trance, experimental which surprise due to the music’s sometimes lyrical atmosphere and its energetic dance floor music resemblance. The favourable results from the brainstorming initiated by Guardi alias Francois Lopez . Here is the electro, which make you hit the ceiling! With a hallucinate richness in sonority… an elaborate French Touch, marrying trance, break beat, modern or experimental film music, never loosing the track with a beat made for the dance floor……a revelation! Electronic music in its widest sense, difficult to stick a label on it, it s so rich and varied. The rock, lyric or jungle passages respond with a sonority of trance music, where each measure marks an evolution, where everything is movement. Each time one listens to the album, there is always something to discover .. Burden is on the way to become the spearhead of the renewed French electronic music. In the wake of Aphex Twin, Autechre and the best representation of the electronica,……Blade Runner, lost in a techno breakbeat futurist club…a revelation, and a remarkable entity on the border of the French Touch.